Wahnsinn!! Rot-weiß-roter Dreifacherfolg beim Junioren-Europacup in Tulcea! Wahnsinn!! Rot-weiß-roter Dreifacherfolg beim Junioren-Europacup in Tulcea! Unfassbar! Herzliche Gratulation Pia Totschnig, Lisa Hufnagl und Anna Piskacek! 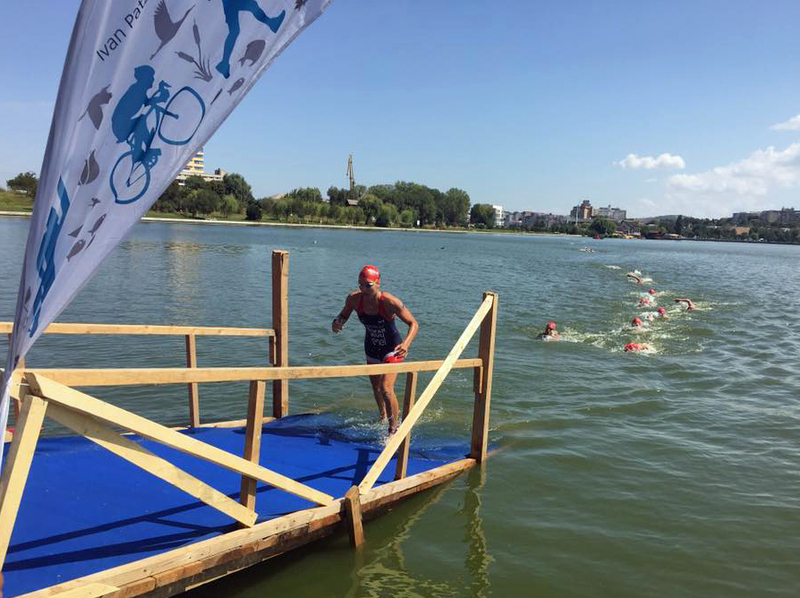 Let’s start our report on Tulcea with a remarkably restrained few words from the Österreichischer Triathlonverband (ÖTRV). 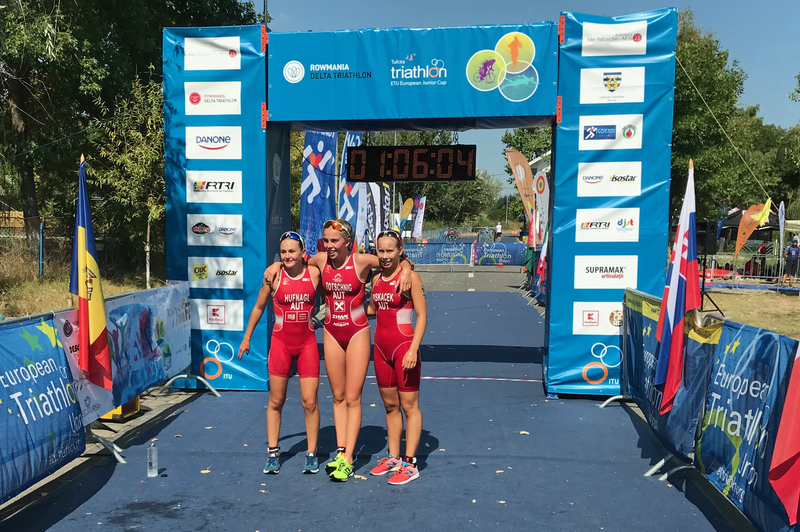 Yes, after a series of obstacles prevented her from getting the results we have seen in the past, Austria’s Pia Totschnig led home to team-mates to fill the podium in Tulcea. Since her win in August last year in Riga, the athlete from the Tirol has struggled to find her form. When she was on form, her bike got lost and she had to borrow the bike of a Junior Male athlete that was a size too big and upon which the saddle could not be adjusted. For that entire race she had to struggle not only with the pouring rain out on the bike course, but also with an over-sized frame that must have caused quite a lot of pressure on her for the 20k. A 5th place there was a remarkable performance in those circumstances. So this weekend in the far eastern reaches of Romania, no doubt the pressure was really on her as she lined up for the start. Having won here in 2016, she knew the course but with all the bad results and the knowledge that she was racing against some tough competitors, it must have been pretty tense for her. 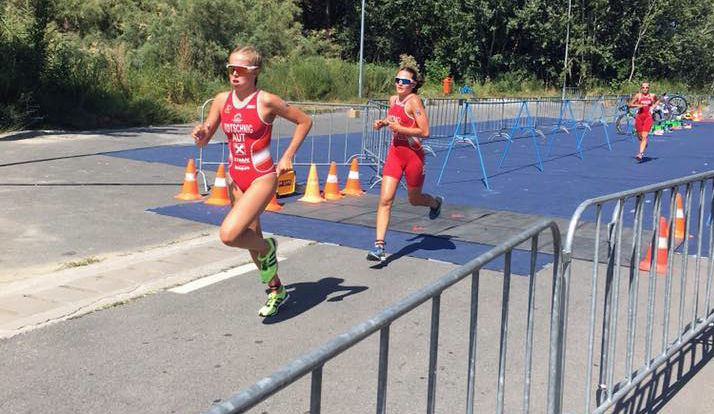 The swim saw Romania’s Rebecca Pojar take a significant lead and, conforming her strength as an emerging junior talent that we saw in Bucharest earlier this year, she led the way to T1. 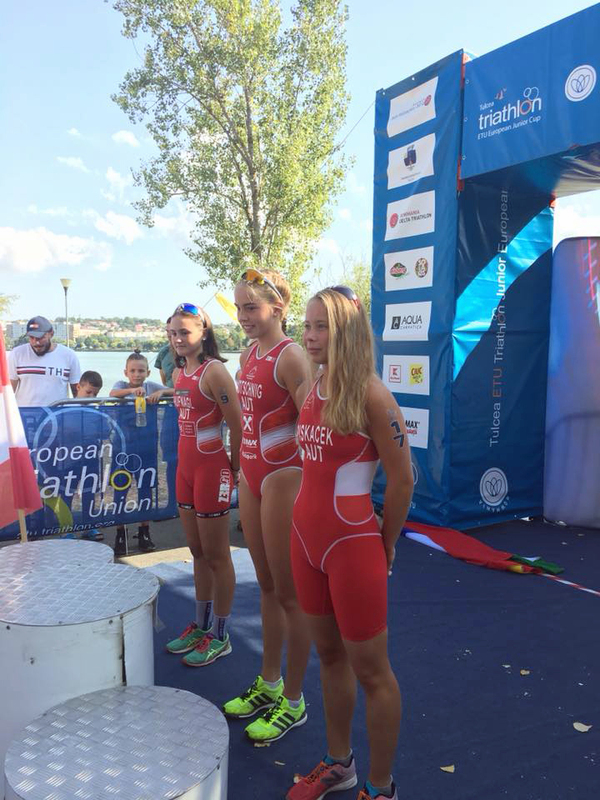 Behind her, Croatia’s two athletes, Ivana Granoša and Paola Horvat were neck and neck. Next back came the first of four Austrian athletes who were locked into this leading 25 seconds of running from water to bike. 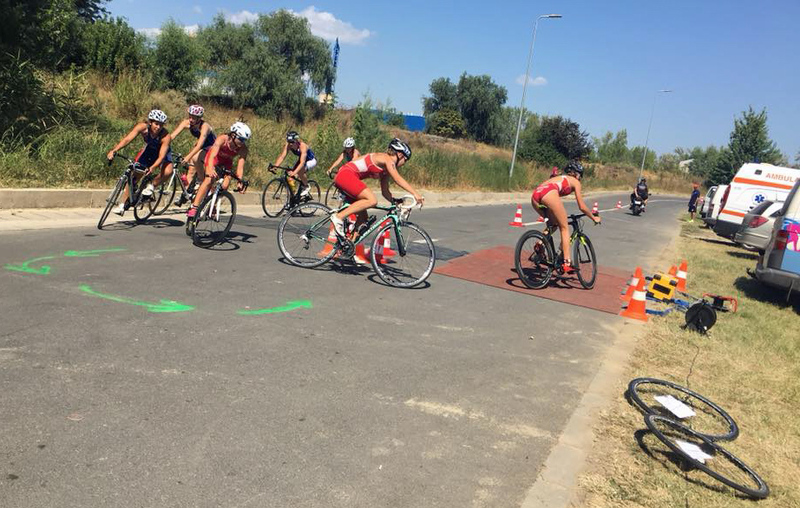 Lisa Hufnagl was a couple of paces ahead of Anna Piskacek, who could just be seen by Pia Totschnig but between the Red and White uniforms, were Til Ocvirk CRO and Hungary’s Bernadett Józsa. As the leading women set off on the bike, the stronger ones grouped together and with Totschnig well-placed, they established a strong lead. Coming into T2 and Totschnig took her time, careful to avoid any penalties. She knew that her run pace was good enough. Out onto the run course and she was in a class of her own. Only her teammates could do anything about her lead and between them, their won battle was established for silver and bronze. With a run that was almost a minute quicker than any other athlete and which was faster than some of the junior men, the ghosts of those past races were well and truly buried as she crossed the line. Hufnagl was able to kick that bit harder and edged out Piskacek to take silver. The Austrian team had dominated the race and earned valuable points for their Federation. 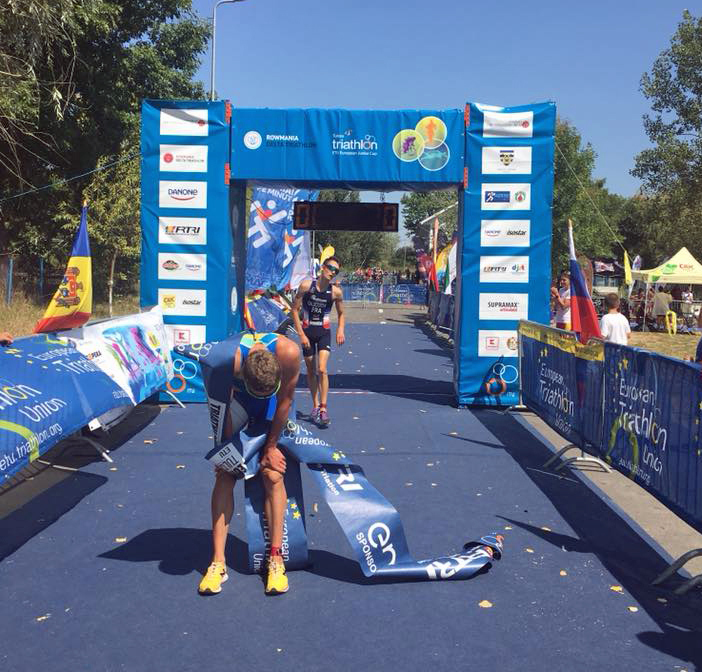 For the men, Ukraine’s Hennadii Anzin led them out of the water, with teammate Oleksiy Astafyev and then did their best to break away from the chase group. The heat was intense and the pack allowed the Ukrainian duo to escape; perhaps thinking that they could catch them on the run. Well, Astafyev suffered badly on the run and was soon in the sights of the chasing athletes who then caught him and left him. Anzin seemed to have it sewn up but suddenly became aware of a terrifying sight; a darker blue uniform of Pierre Galbourdin FRA. His 26th place last weekend in Žilina did not set off any alarm bells but a closer look at his run pace should have made everyone sit up and pay attention. With every stride, the Frenchman was gaining on the medal positions. He sped past Hungary’s Viktor Mészáros but just ran out of run course, with Anzin in sight. The Ukrainian came so close to losing out on the title to a man who ran 14:40 for the 5k. With the season rapidly coming to an end, the Austrian performance this weekend in Tulcea was the standout one. 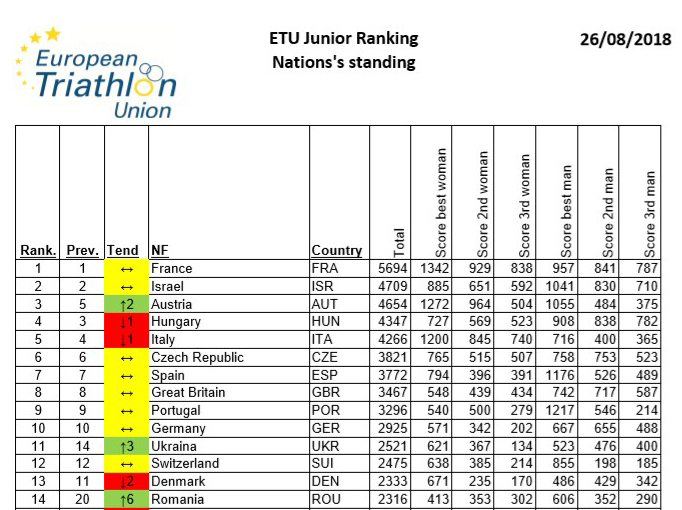 A clean sweep for the women and top ten results for the men, the National Federation can rightly celebrate as the Junior Rankings table shows them moving into third place behind Israel and France. 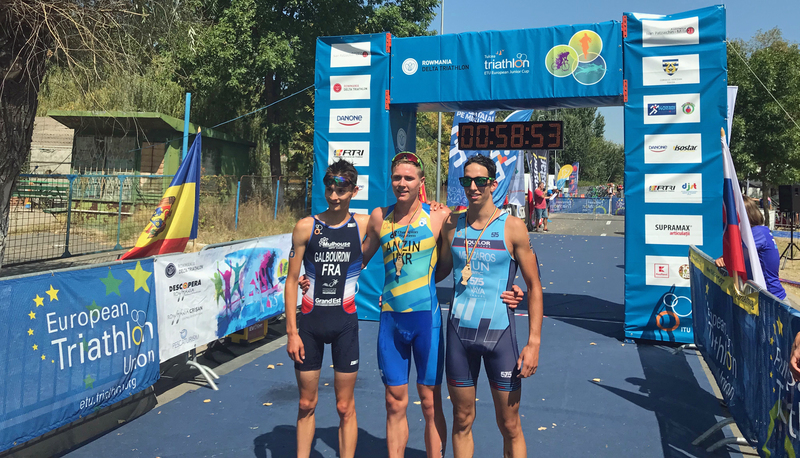 Ukraine and Romania both move up the table and although not in with a chance to claim any of the top three places, these results show that the investment they have made in their juniors athlete development programme is really beginning to pay off. 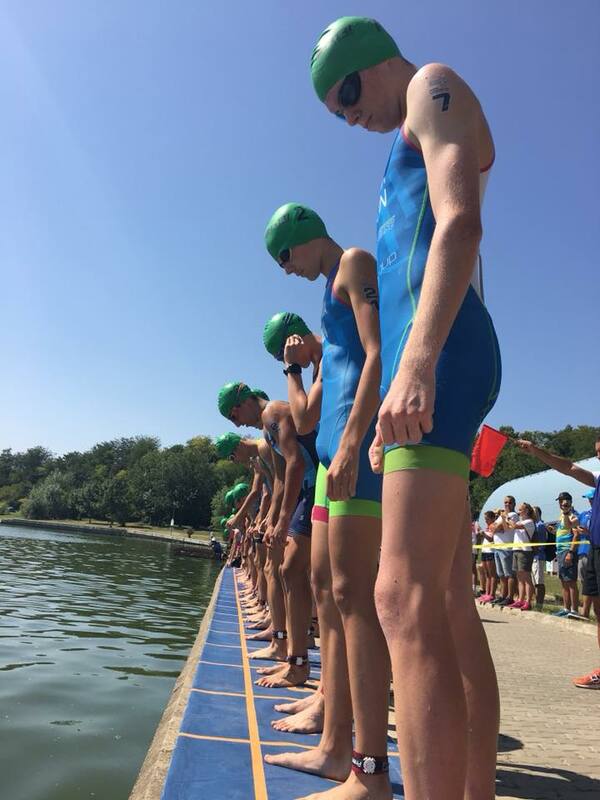 Our next big event is going to be the Youth Festival in Loutraki where athletes will have the chance to follow a series of events over the week and celebrate the sport with a final race. We will bring you an update in a day or two but now it is time to say once again, Thank you Tulcea.